Avoid Paying Additional UPS up-charges! 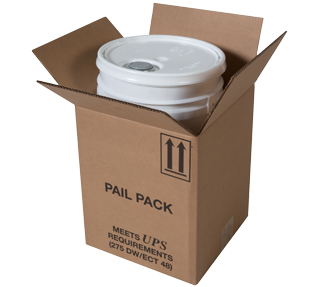 The Pailpak will Save you money on UPS shipments. Meets or Exceeds UPS requirements. Any 3 1/2 to 5 gallon pail without an overpack shipping carton incurs up to a $10.00 special handling charge. Why pay additional UPS charges? All packages with a gross weight of more than 20 pounds must be in a 275 lb. burst strength double wall carton rather than a 200 lb single wall carton. The NPS Pailpak™ satisfies this requirement while saving you money on each and every pail you ship. Note: If shipping a Hazardous Material in a UN Certified inner packaging you must affix an “OVERPACK” label to the Pailpak along with all of the other required labels for the HAZMAT being shipped. Speak to one of our friendly customer service representatives today.